It makes me so happy when my yarn babies arrive in their new homes. Apart from one that is taking its own sweet time, all orders from the past couple of weeks have been delivered and are now in their new homes. I hope you all enjoy transforming your new Dubai Knits yarns. If you are on Instagram, I would love it if you used #dubaiknits on your post so that I can see what becomes of my yarn babies. Feel free to tag me as well @dubaiknits. There are still a few skeins in the store if you haven’t picked up your yarn for the Whakairo Cowl. Frenchie is also hosting the Spring Fibre Muse KAL! You can join in the Fibre Muse Circle Facebook group or on Instagram, using the hashtag #springfibremusekal. Follow Frenchie on Instagram @arohaknits for updates. I started my own Whaikairo cowl yesterday on cast on day. I decided to use a skein of Luna dyed in cochineal which is then dipped in indigo. I was having a tough time choosing from all the Yara bases (which is what Frenchie used for the design) but decided to leave those for you all! Here is a look at my WIP after finishing the setup rows. 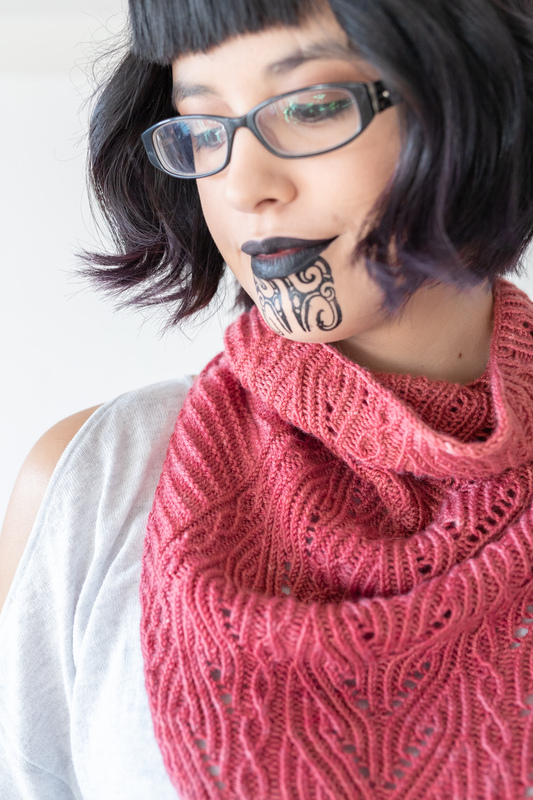 Saving the best for last: I will have Whakairo Cowl kits coming! The kit will include a choice of yarn base in pre-selected colourways plus a purchase code for the pattern on Ravelry. I’m working out the listing and will put them up shortly. There should be plenty of time for you to grab a kit and join the KAL. I’ll be back with the kit update soon! 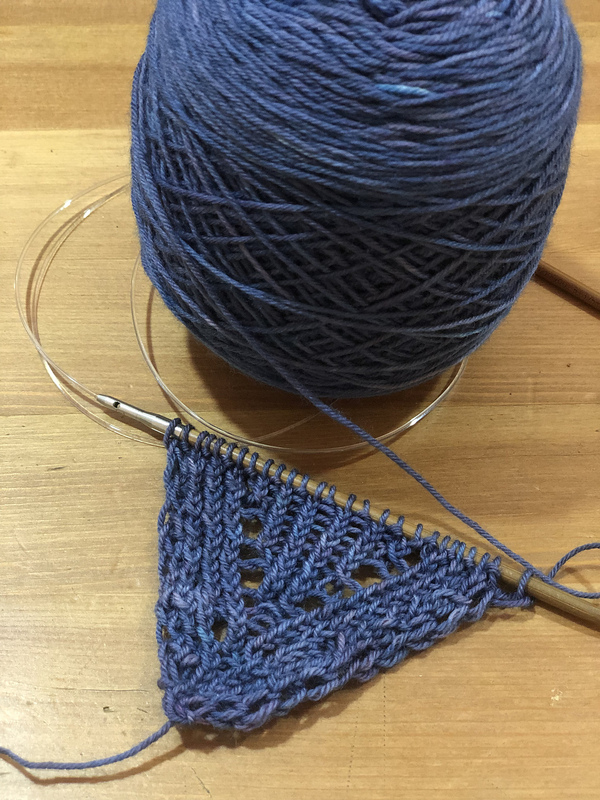 This past weekend, Francoise Danoy of Aroha Knits released a cowl pattern using one of my natural-dyed yarns. The response from the knitting community has been overwhelming, so thank you, everyone who has left kind words on social media, bought the pattern and the yarn and those who continue to support this little shop by spreading the word. Thank you. It all started with this “zombie” skein of Anya which we used as a tester for dyes at a workshop held in November 2017. It’s not the prettiest skein but it had potential so I decided to play around with it and thought I could split them into two or three equal balls and knit them at the same time. I had to do some knitting math, nothing too difficult but still not something I do on a regular basis so it took a bit longer than I would have liked. I started knitting and with 3 strands held together, the hat worked up so quickly. Pleased with my progress, I decided to pull out another skein of sock yarn, this time Luna to see if I could repeat the results. And I did! Spurred by this success, I decided to write out the pattern. And then the holidays happened. And there was a move from one town to another. You know how it is. 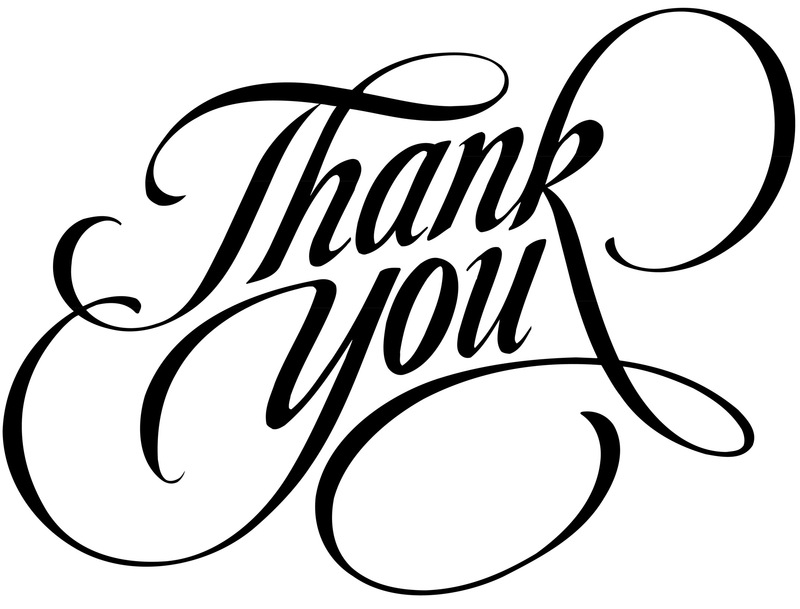 I managed to send the pattern out to testers who all came back to me rather quickly so I am grateful to all of them. The pattern is now available on Ravelry. You can get it here: Vanilla Hat. I hope you will enjoy making many colourful hats with this pattern. If you have any questions, please email dubaiknits@gmail.com. Thank you for your continued support. And you may have noticed a re-branding of Dubai Knits. Or maybe not. But I was so happy to have come across Katie and Brittany of Kaba Creative who worked up the new logos for the shop. I could not be happier! They are a wonderful team to work with, they get me, they get what I needed to say with a simple image. If you need to get creative, take a fresh turn and revive the image for your business, then do not hesitate to contact these ladies. You will not regret trusting them! On to other things, with the new logos come a shop update. Yay! I have neglected the shop for far too long and it’s time I correct that. I will now have a separate stock for what goes listed here online and what my local knitting group, the UAE Amiras can get their grabby hands on (no really, I love them all to bits!). That way, I don’t have to worry about not being able to fulfill orders if the yarns are out being squished by the Amiras. I have been dyeing up yarn and saving them for this shop update. I hope you will like what I bring. Luna will be re-stocked along with Moonbeams, Solis, Cloud Nine and Scrolls. Good old Superwash DK has had a re-branding too! It is now called Aura, but it is still the same squishy, sproingy 100% superwash merino that it has always been. That’s all for now, just bringing you up to speed on what has been happening and what you can look forward to. Thank you and see you on Monday for the shop update. A lot of yarns are going to their new homes soon – thanks to everyone who supported the sale today. Still plenty more left and the good stuff is yet to come. And by good stuff I mean the silk-blends. I could go post them now but I wanted to take better photos of the yarn so you can appreciate them better. Faith, Hope and Love and Pure of Heart skeins will be posted soon. It took a little longer than I anticipated, but the yarns in stock are now all accounted for. Fresh start, new season, new ideas, so we’re having a sale. The listings are for all yarns in stock, available only in quantities as stated, which are on sale until stocks last. Thank you very much for your continued support of my little shop. Happy knitting!